We all knew Apple would release an adapter to make your old 30-pin accessories work with your brand new iPhone, but who knew Apple would try to rob you for it. Apple also has a 0.2m version that will cost $40...So if you happen to want to use your new iPhone with your car stereo or you dock, you're going to have to plop down a good chunk of change. For a piece of plastic, $30 is a bit much. I mean, the MagSafe 2 adaptor only cost a reasonable $10. 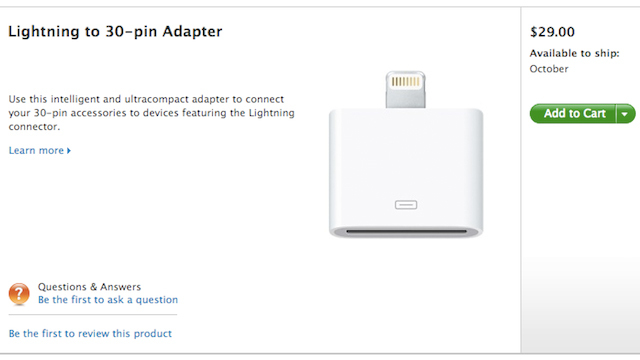 On top of this, the adaptor also doesn't ship until October. It would probably be best to wait and find a Chinese copy off ebay for 10 cents instead of letting Apple steal your money.